Datchet’s riverfront as we know it was created by the Barker Bridge House Trust from 1865, as a landing place for small boats and public river access. Until then, a muddy slope ran down from the road to the natural river bank below, but by pile-driving and ‘campshedding’ the contractors Sears & Sons built the present river wall with its path and steps. They also levelled and grassed the slope of land up to the road, where a fence of posts and rails was built. 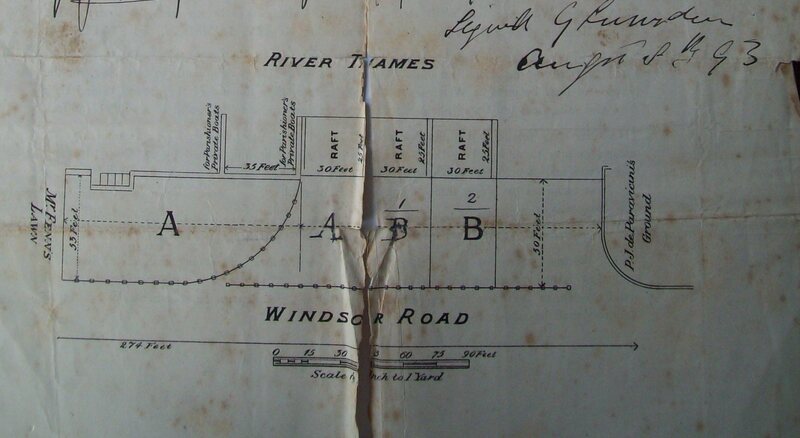 The earliest large-scale map of the riverfront area (below) was drawn in 1847, during plans for the railway line and creation of the new Windsor Road. 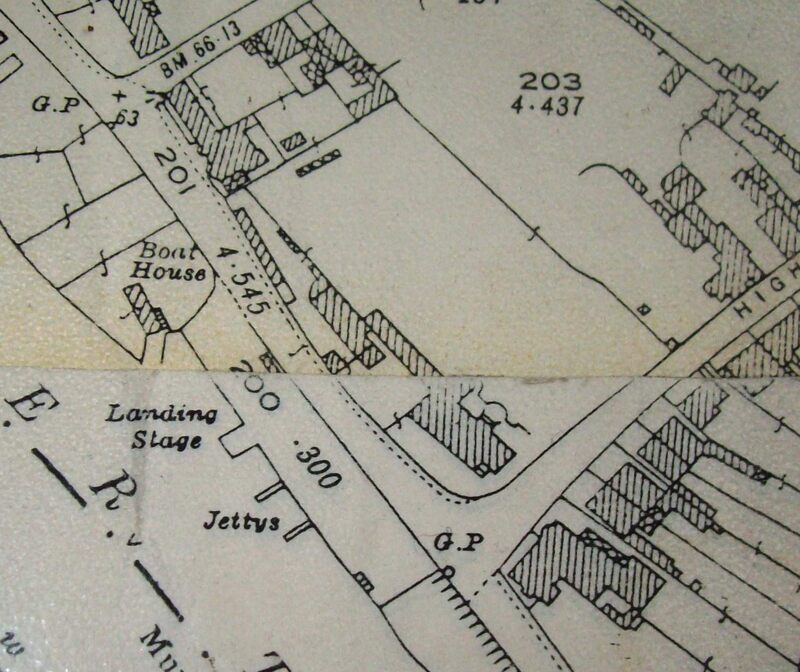 All the plots of land were numbered and an accompanying list gave the owners and use of the property. 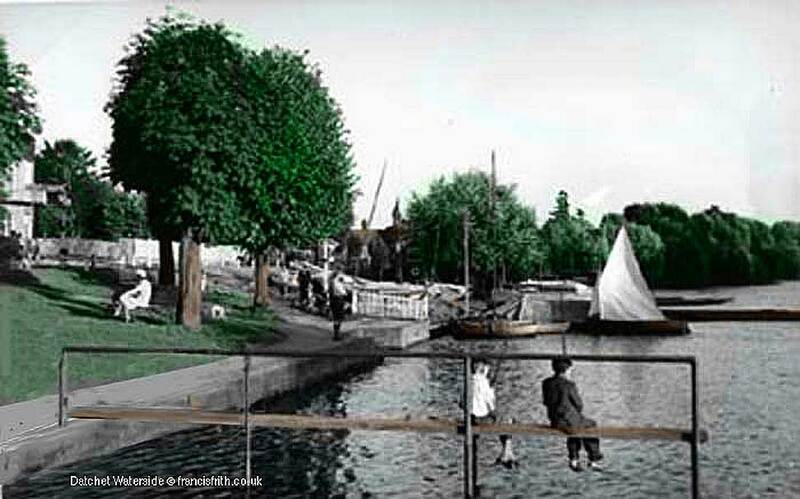 Datchet Bridge was in use until 1850, and the river bank was still a natural one. 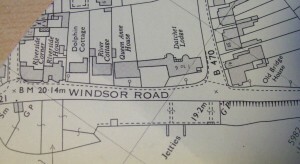 From the west (left): plot A belonged to the house called The Willows at the foot of Queens Road, owned by the Lord of the Manor and occupied by Henry Newman as riverside eyots for growing willows and fishing. 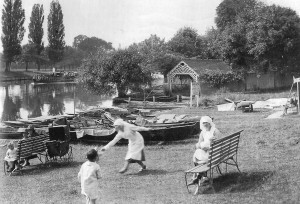 Plot B, a garden belonging to the Cooper family, owners of the houses now called Riverside and Riverside Corner. 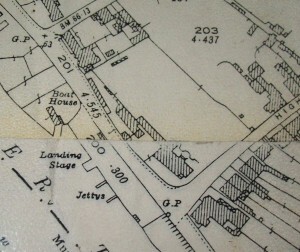 Plot C, a landing place owned by the Parish of Datchet, which was the church parish at that time and was passed to the new civil Datchet Parish Council’s ownership in 1895. 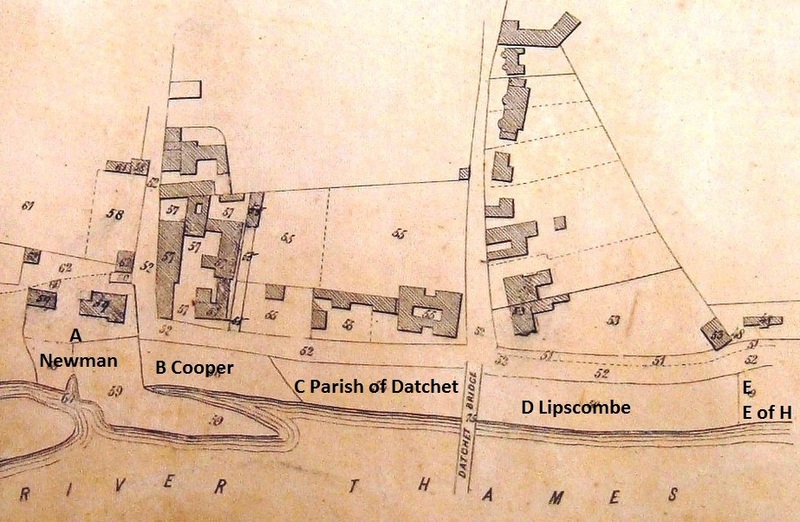 Plot D, east of Datchet Bridge, was described as pasture and a landing place, occupied by Lipscombe. Plot E was owned by the Lascelles family, Earls of Harewood, and has remained as private property. In modern times, the areas A and part of B belong to Crown Estate and are leased as river gardens to the houses immediately to the north. 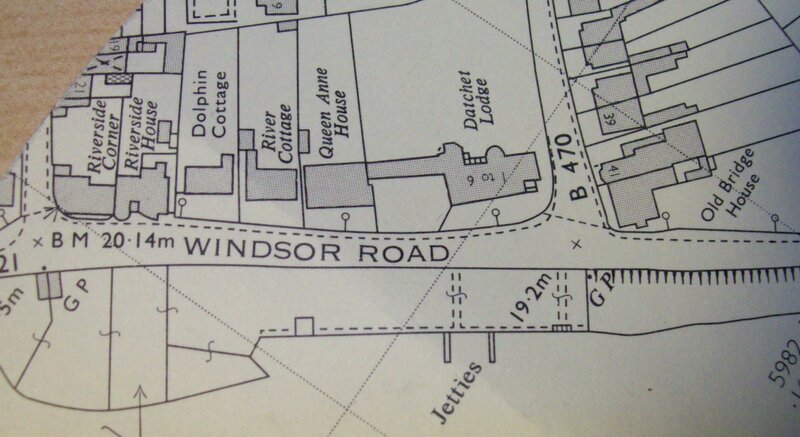 Plot C and the adjacent part of plot B belong to Datchet Parish Council as the public riverfront, and plot D is now Kris Cruisers boat hire site. The Barker Bridge Trust planned to create a landing place for small boats and for public river access as part of their plans to improve the village. 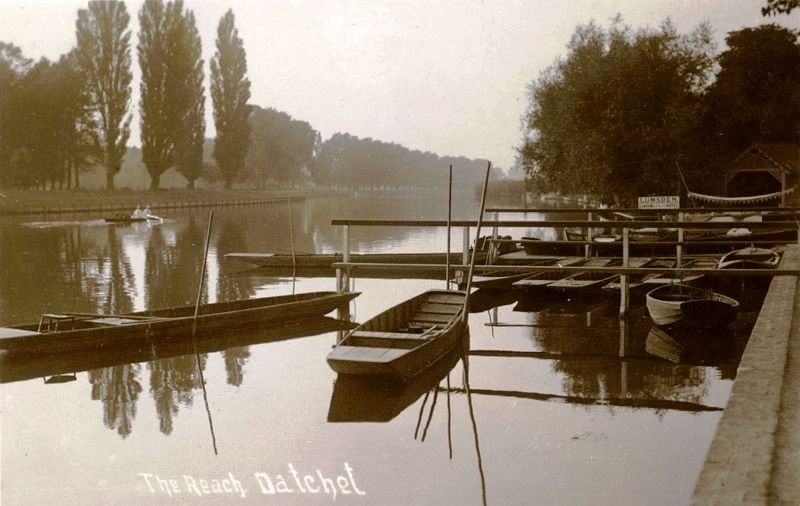 In 1865, about 15 years after Datchet Bridge was demolished, the local builders Messrs Sears & Son were contracted for making a brick retaining wall and path, with steps leading to the water’s edge. The area between this path and the road edge above was grassed, while Joseph Boulter was paid for making rails at the roadside and jetties for mooring boats. In 1868 Sears was paid for extending the brick-walled landing place further upstream to the west, perhaps to include part of plot B. 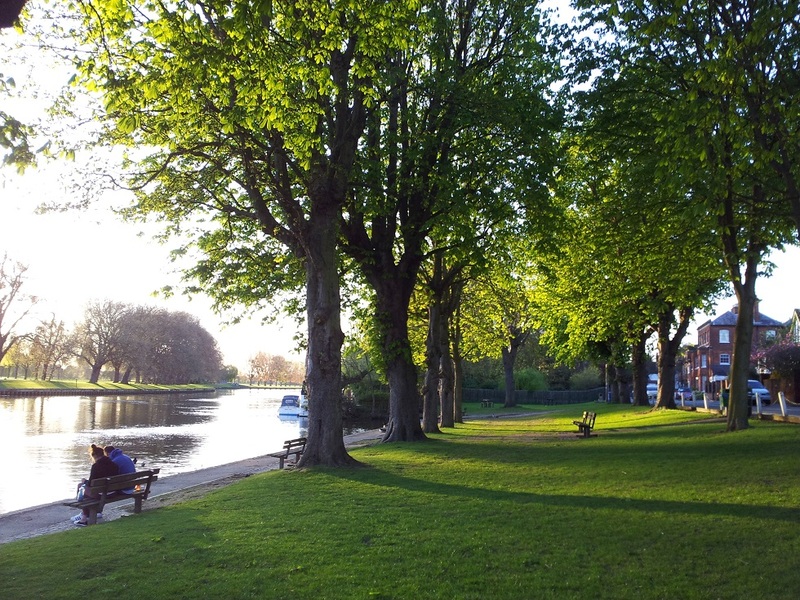 It is partly due to the Trust’s historic role in building the original riverfront that Trustees have agreed to contribute to the present refurbishment work. On the left, Mr Fenn’s Lawn was Kris Cruisers’ site, and on the right P.J. de Paravicini’s ground was Riverside‘s private garden. Only the area A behind the jetties was grassed for public use and separated from the watermen’s sites by posts and rails. The most recent jetties were in the same places, and probably the same size, as these original ones. The watermen’s flat rafts can be seen in later photographs, and it is assumed they would be removed during the winter season. The plan incidentally gives the length of the original jetties (presumably not replaced since 1865), as 25ft, the same as shown for the rafts. This was also the length of the scaffolding jetties recently removed, so they had been the same size for the last 150 years. In the late nineteenth and early twentieth centuries Datchet became a popular riverside resort, though on a very much smaller scale than Maidenhead or Henley. 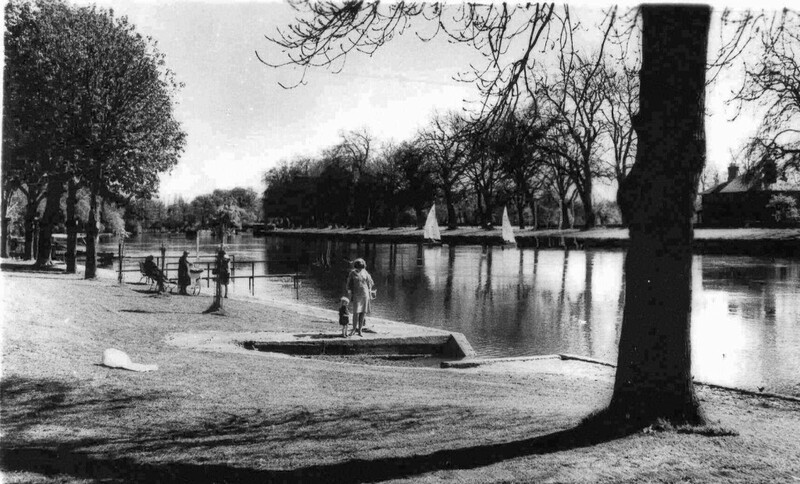 River sports, both serious and silly, were held here frequently during this period and a regatta was sometimes staged many decades later. Between the two red dots is the public grassed area with two jetties along to the left; beyond the left red dot are the watermen’s stores, while beyond the right red dot and past the fence is Fenn’s boat hire section (Kris Cruisers). This photo seems to have been taken with a wide lens which distorts the length of the riverfront and makes comparison with modern times, and with maps and plans, more difficult. In particular the two original jetties look as if they were much further to the west than the most recent ones, but they were actually in the same places. The present Kris Cruisers site was described as ‘pasture and landing place’ in 1847, and seems still to have been a grassy lawn by the 1890s. 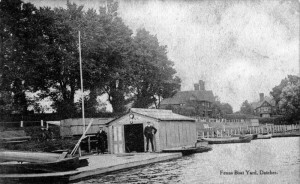 John Fenn was first listed as a boatbuilder in 1891, living in Montagu Road (at number 32, then and now Haslemere), and using the land behind the house for boat storage in the winter. By 1907 Thomas Burfoot had become his partner and they ran the business together until the late 1930s. 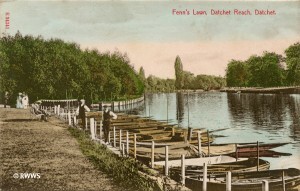 After the war Percy Dann hired boats from here, followed by John Hicks. By the 1920s the old watermens’ section had been grassed over and the storage buildings demolished, in order to extend the public area to its present size. 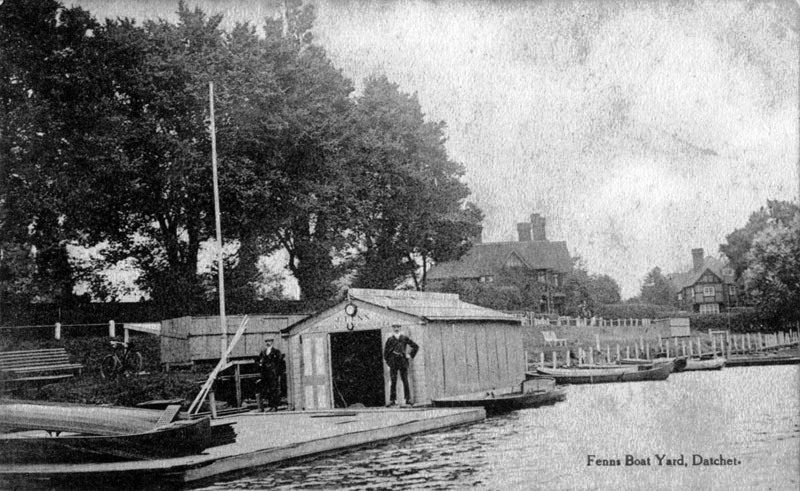 George Lumsden, the oldest of the three original watermen in 1893, was still hiring out rowing boats and punts, but from a boathouse and sheds built over the inlet at the west end of the riverfront. He lived in Thames Cottage in the High Street from the the 1890s to 1920s, when Percy Dann took over the hire business on the riverfront, and later also at Fenn & Burfoot’s site.. In the third photo below, a notice by the boat shed is headed ‘Manor Hotel’ (the rest is illegible), so presumably Dann had a hiring arrangement with the hotel. 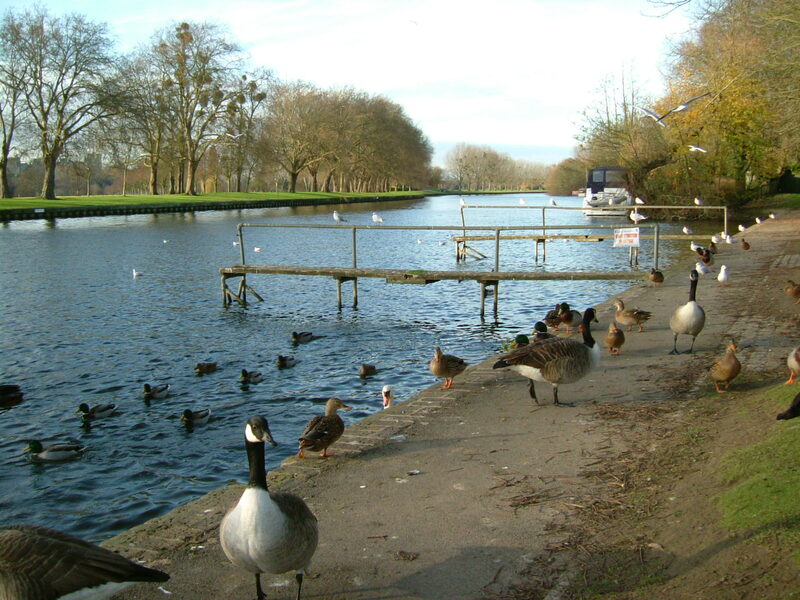 The two jetties (as wooden structures), can be seen and many more punts and boats are moored along a flat raft or pontoon. Compared with modern times, all these boats are shallow or flat and do not intrude into the lovely river views. The middle photo shows the horse-chestnut trees as little more than saplings. The 1932 map shows Lumsden’s and Dann’s boathouse over the western inlet, the two original jetties, and a solid landing stage replacing the moveable pontoons. 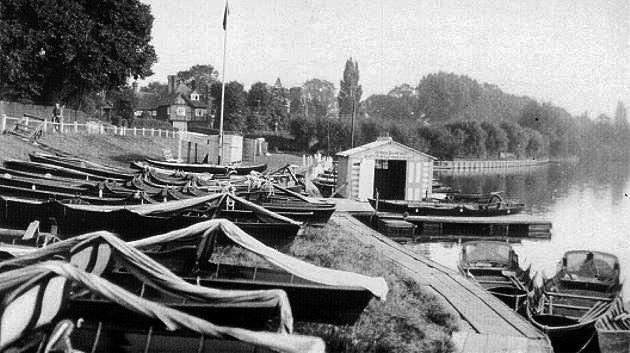 Both the boathouse and the landing stage had been removed by the late 1960s or early 1970s and the present safety access ramp had been built instead, further west towards the inlet. 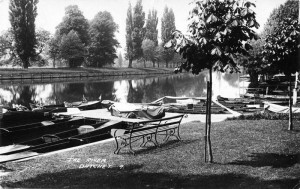 John Hicks’ boat hire remained on the commercial site to the east of the riverfront until in 1966 the business was bought by Len and Lou Clark. They and their family have now run the business as Kris Cruisers for fifty years. 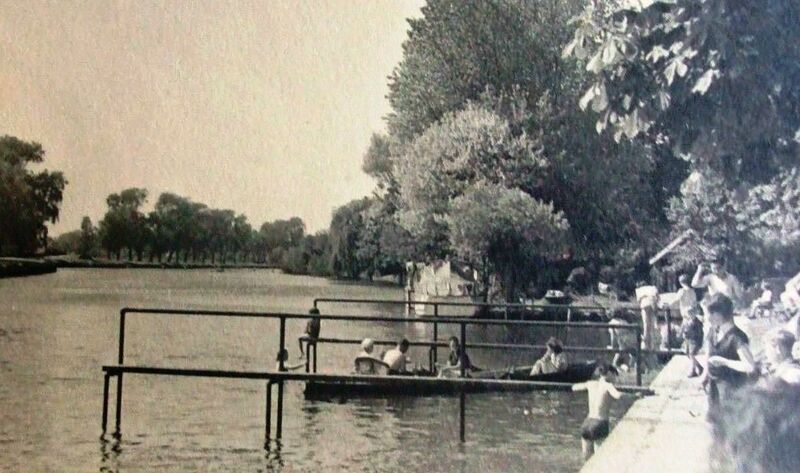 At some time between the 1930s and 1960s the old wooden jetties were replaced by the very ugly scaffolding structures which have recently been removed. 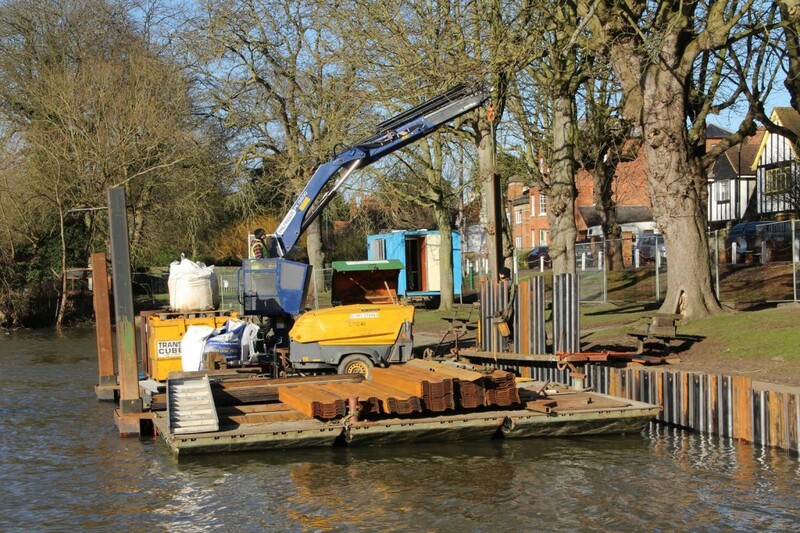 The photo on left below is one of the last that was taken of the derelict jetties, and on right is Cook Piling of Reading as they worked on the new river wall in January 2016. 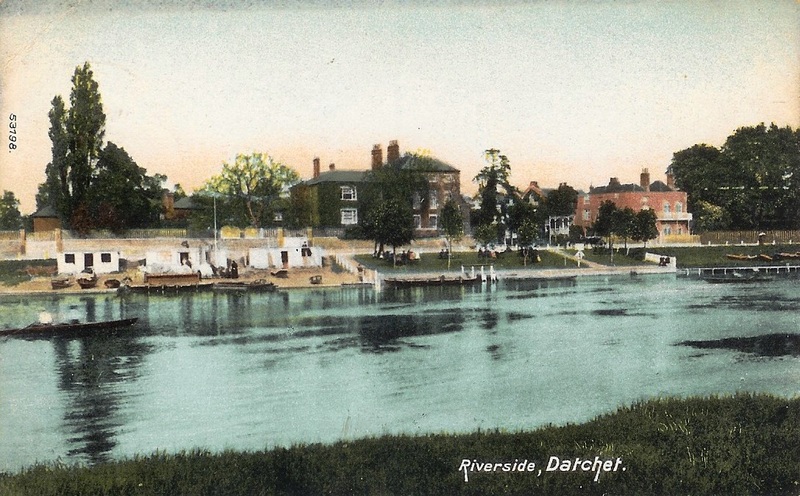 To see more images of the riverfront since the jetties were removed, visit Datchet Village Society’s Riverside photo pages.